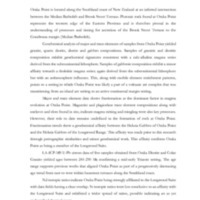 Oraka Point is located along the Southland coast of New Zealand at an inferred intersection between the Median Batholith and Brook Street Terrane. Plutonic rock found at Oraka Point represents the western edge of the Eastern Province and is therefore pivotal in the understanding of processes and timing for accretion of the Brook Street Terrane to the Gondwana margin (Median Batholith). Geochemical analysis of major and trace elements of samples from Oraka Point yielded granite, quartz diorite, diorite and gabbro compositions. Samples of granitic and dioritic composition exhibit geochemical signatures consistent with a calc-alkaline magma series derived from the subcontinental lithosphere. Samples of gabbroic composition exhibit a minor affinity towards a tholeiitic magma series; again derived from the subcontinental lithosphere but with an asthenosphere influence. This, along with mobile element enrichment patterns, points to a setting in which Oraka Point was likely a part of a volcanic arc complex that was transitioning from an island arc setting to an active continental margin setting. Major and trace element data shows fractionation as the dominant factor in magma evolution at Oraka Point. Magnetite and plagioclase trace element compositions along with enclaves and clots found in situ, indicate magma mixing and mingling were also key processes. However, their role to date remains undefined in the formation of rock at Oraka Point. Fractionation trends show a geochemical affinity between the Hekeia Gabbro of Oraka Point and the Hekeia Gabbro of the Longwood Range. This affinity was made prior to this research through petrographic similarities and minor geochemical work. This affinity confirms Oraka Point as being a member of the Longwood Suite. LA-ICP-MS U-Pb zircon data of five samples obtained from Oraka Diorite and Colac Granite yielded ages between 241-250 Ma confirming a mid-early Triassic setting. The age range supports previous works that aligned Oraka Point as part of a progressively decreasing age trend from east to west within basement terranes along the Southland coast. Nd isotopic ratios indicate Oraka Point being strongly affiliated to the Longwood Suite with data fields having a clear overlap. Sr isotopic ratios were less conclusive to an affinity with the Longwood Suite and exhibited a wider spread of ratios, possible indicating an as yet undescribed thermal event. The new data presented here has led to Oraka Point as being interpreted as deriving from magmas that share the volcanic arc signature of the primitive Brook Street Terrane. The data also shows evidence for a transition towards the evolved Gondwanan continental margin signature. Galloway, James Robert (James), “Igneous Petrogenesis of Plutonic Rock at Oraka Point, Southland,” Otago Geology Theses, accessed April 22, 2019, http://theses.otagogeology.org.nz/items/show/650.